We received a call Sunday night about an adult Bald Eagle unable to fly near Wausau, WI. We had a similar call a few miles from the site the day before, but the eagle had disappeared into the woods before we were able to rescue it. 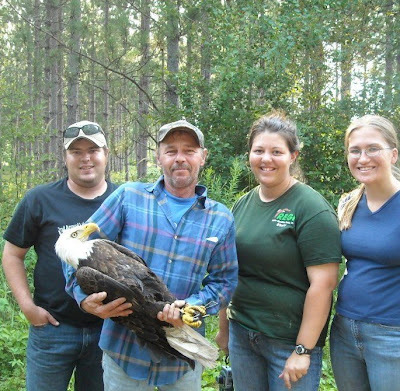 So, we grabbed Natasha and her boyfriend Brad and our new intern, University of MN Pre Vet student, Elizabeth and were off to make the hour plus drive to try to find the eagle that was in trouble. 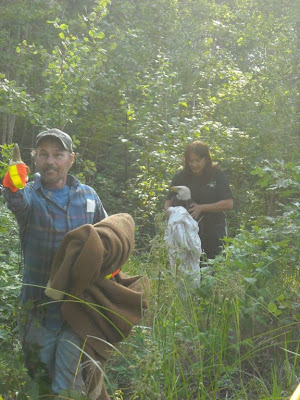 (Photo: Ron Drayler, the citizen that first located the injured eagle and called REGI for help, holds the bird for a photo. The location of the bird first appeared to be a wooded area. I incorrectly assumed we would be able to find him, rescue him and then be home for a late dinner. What I didn't see what the thick swamp behind what turned out to be a small stand of trees. The eagle was no where to be found when we arrived. Since we had previous calls on what I thought was the same bird, I wanted to do our best to find him. Wildlife hides when they are in trouble and disappear quickly into thickets in an effort to protect themselves while they are injured and vulnerable. The short part of a long story is, with Ron in the lead I followed into the swamp. The ground was wet and my adventure began. It was a few hours later by the time I located the eagle. To capture him I ended up knee deep in dark swamp muck. For those of you that are not familiar with swamp muck, it acts like quick sand. Before I knew it I had lost a shoe and then the other shoe. I retrieved both shoes but before the adventure was over had lost them each again. To say I was tired by the time I had the eagle in arm is an understatement. Looking at the photos taken at the time, I am not sure if the eagle was more exhausted or me. 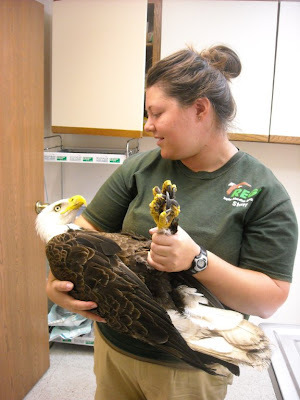 ( Photo: Natasha holds the Bald Eagle at the Antigo Veterinary Clinic while waiting for x-rays. 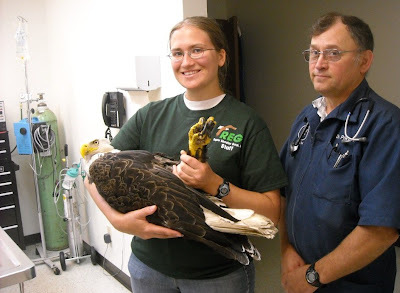 We are so grateful to the terrific veterinarians at the Antigo Veterinary Clinic in Antigo for their care and help with our wild birds. They have a very busy practice but somehow always make time for our patients. I worried the right wing of the eagle may have had an old fracture however, the x-rays did not revel any fractures. No pieces of lead that might cause toxin were found either. The eagles blood lead was also within low normal limits. 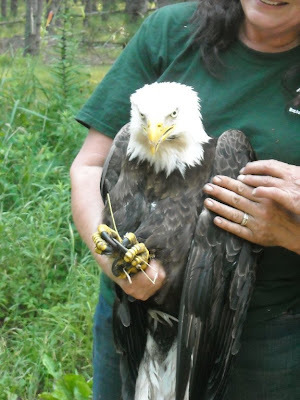 That is a surprise since almost every Bald Eagle cared for at REGI has some degree of lead poisoning. He is anemic however and was low in weight. We will keep looking for a reason for him to be debilitated. It could be as simple as he was injured in some way and was not able to hunt during that time. Starvation could be the reason he is now too weak to fly and why he is anemic. Wildlife cases are always a puzzle. We take all the clues we can from the history and then piece it together. We are very optimistic for this eagle to return to the wild. He is now eating well and is getting stronger. Orion went home yesterday. 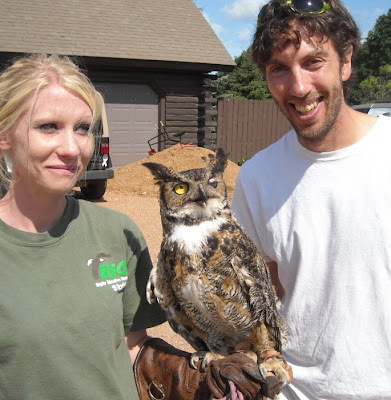 Orion is the educational Great-horned Owl that was housed at REGI while his enclosure was finished at Trees for Tomorrow in Eagle River. His handler Troy Walters is very dedicated and traveled to the REGI facility in Antigo to keep up with Orion's training. Troy was here so often we began to feel like he was a part of the REGI family. We will miss them both now that they are back in Eagle River, but know a bright future in wildlife education awaits them both. 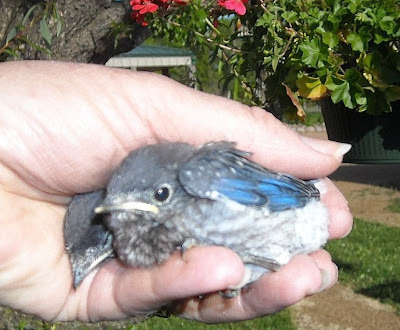 We have had many more admits including lots of baby Cedar Waxwings and Eastern Bluebirds. They are such beautiful little tykes and a joy to have in care. So, if you have been expecting an email from me and did't get it, please call.